A rare visitor to the UK early in December 2018 was Antonov An-22A Antei. 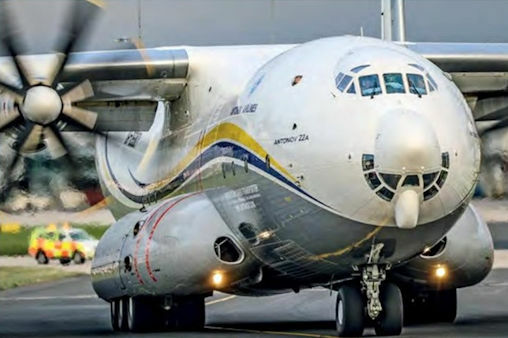 The An-22A is the largest turboprop aircraft ever built, at 57.9m (189ft) in length, 12.53m (41ft) in height and with a 64.40m (211ft 4in) wingspan. 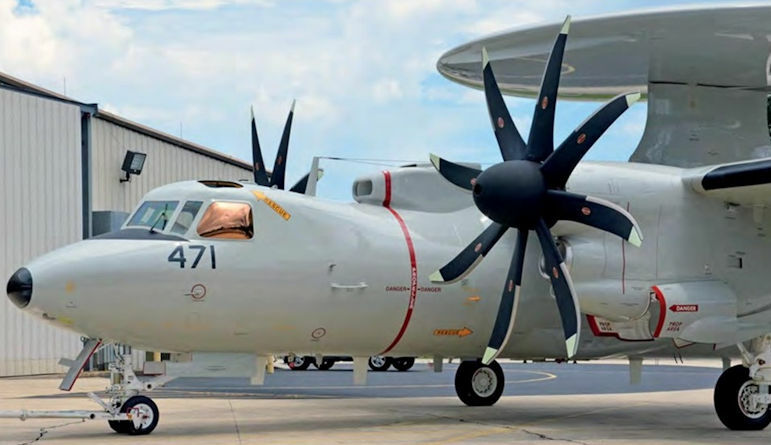 Eight contra-rotating propellers are fitted to the An-22A’s Kuznetsov NK-12MA turboprops. BABCOCK AUSTRALIA has shipped two Airbus Helicopters H175s to Australia for offshore operations from Dili in Timor Leste. 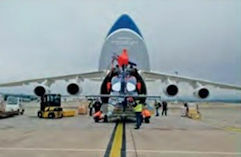 The helicopters arrived in Darwin aboard a chartered Antonov An-124 freighter on November 2017 and are the first of their type to operate in Australia. The super medium H175s will be operated from Dili by Babcock Offshore Services Australasia on contract. Flown for the first time on November 27, 2017, Be-200Chs (c/n 305), wearing the Russian state aircraft registration RF-31140, is slated for delivery to the Ministry of Emergency Situations at the end of December 2017. 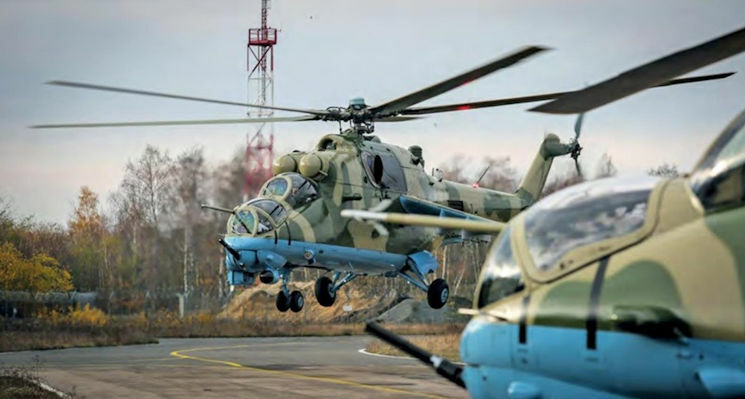 Senegalese Mil-24V-1 Hind-E attack helicopters 6W-HCB and 6W-HCC at the Wojskowe Zaktady Lotnicze 1 facility at Lodz-Lublinek airport, Poland. Tu-160 Blackjack 8-04 outside the Kazan Aircraft Plant production hall on November 16, 2017. United Arab Emirates Air Force Block 60 F-16E 3081, one of 79 in service. 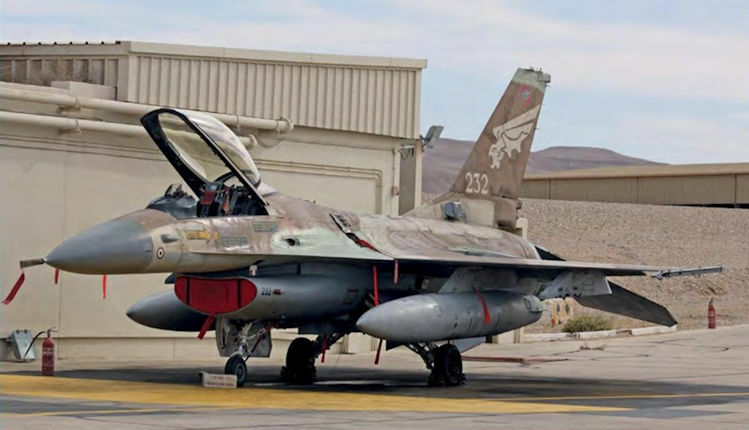 Israel has offered to supply Croatia with surplus F-16A Netz like this 116 'Defenders of the South' Squadron example to replace its veteran MiG-21s. The last F-16 to be built at Fort Worth, F-16-52-CF serial number 1636 (c/n RA-28), takes off on delivery to Iraq on November 14, 2017. All further production will take place at a new facility at Greenville, South Carolina. Lynx AH9A ZG885 assigned to 657 Squadron on Salisbury plain training area in early December 2017. 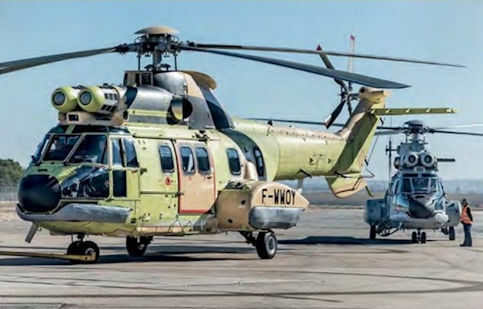 Seen lifting off from Albacete on its two-hour flight to Rota is Armada AB212 Plus HA.18-4/01-308, the fifth of seven helicopters to be modernised under a programme dubbed Programa de Extension de Vida de los Helicopteros. 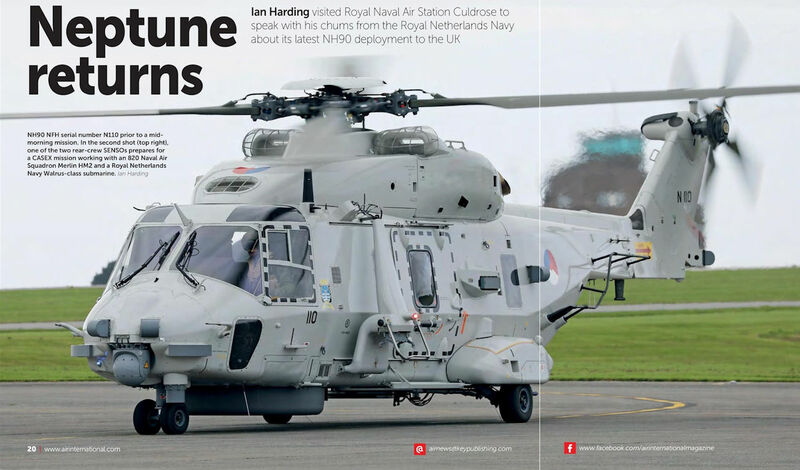 NH90 NFH serial number N110 prior to a mid-morning mission. 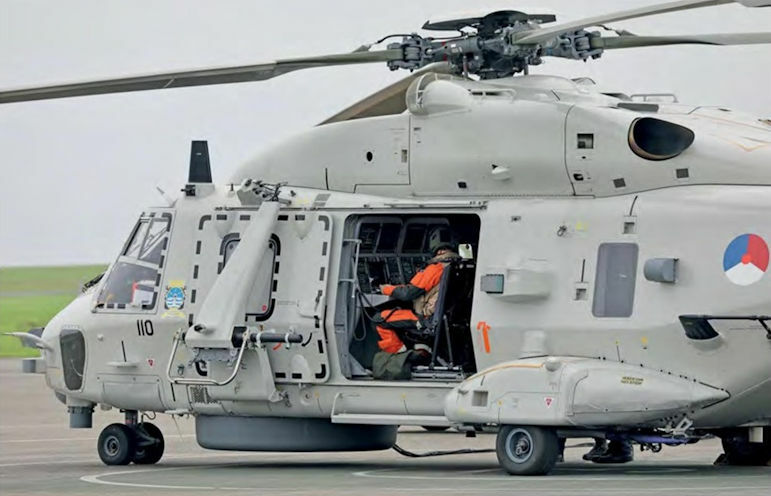 One of the two rear-crew SENSOs prepares for a CASEX mission working with an 820 Naval Air Squadron Merlin HM2 and a Royal Netherlands Navy Walrus-class submarine. With the retirement of the only P-3A in EA ser­vice, the Grupo 22 roster is now reduced to just three P-3Ms. 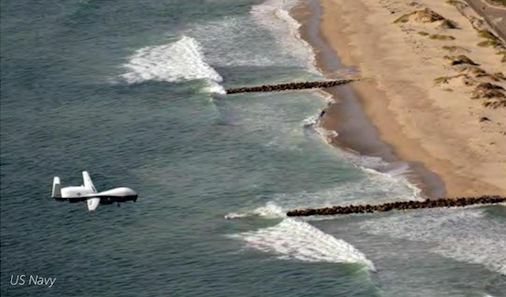 Seen here is the aircraft performing a final flypast over Cuatro Vientos Air Base prior its very last landing. 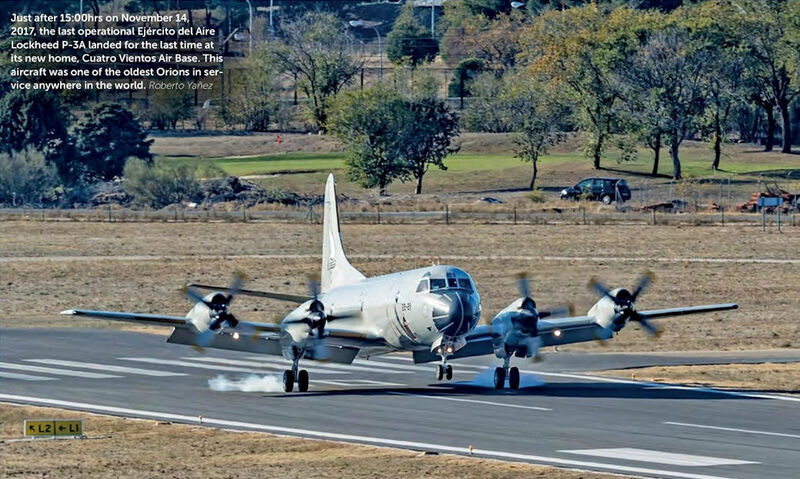 Just after 15:00hrs on November 14, 2017, the last operational Ejercito del Aire Lockheed P-3A landed for the last time at its new home, Cuatro Vientos Air Base. This aircraft was one of the oldest Orions in ser­vice anywhere in the world. 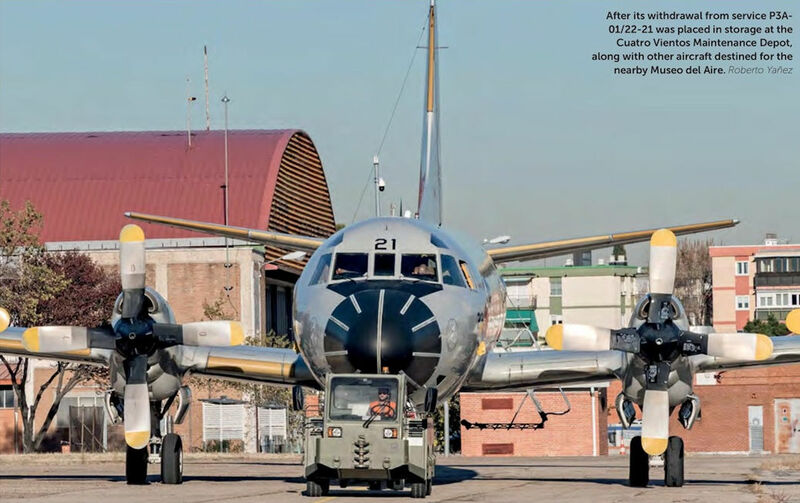 After its withdrawal from service P3A-01/22-21 was placed in storage at the Cuatro Vientos Maintenance Depot, along with other aircraft destined for the nearby Museo del Aire. 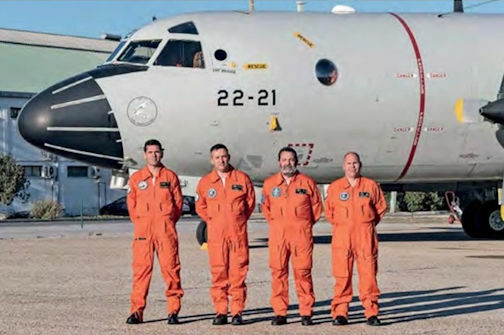 As a tribute to veterans and former members of the unit, some of whom were present to say goodbye to an old comrade after its last mission, the crew of radio call sign 'CISNE 31' dressed in orange flight suits like the ones used by the EA in the 1970s. Despite impending retirement, Grupo 22's maintenance personnel kept P3A-01 in tip-top operational condition. 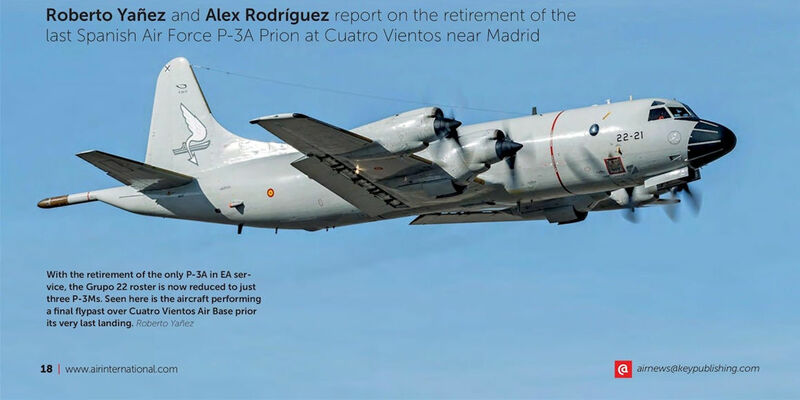 It provided 24-hour SAR coverage for the Madrid and Barcelona Flight Information Regions during the summer, before deploying to Djibouti to cover for one of the deployed Spanish P-3Ms while it underwent periodic maintenance. Northrop Grumman announced it flew the first of two E-2D Advanced Hawkeye early warning and surveillance aircraft it is building for Japan at the company's Aircraft Integration Centre of Excellence in St Augustine, Florida, on November 13, 2017. The new aircraft will join Japan's existing fleet of 13 E-2Cs next year. 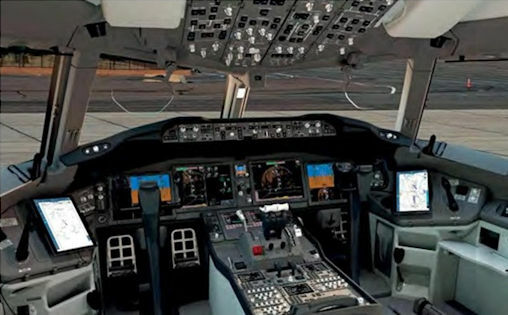 The resemblance to the 787 is evident from newly released images of the 777X flight deck. 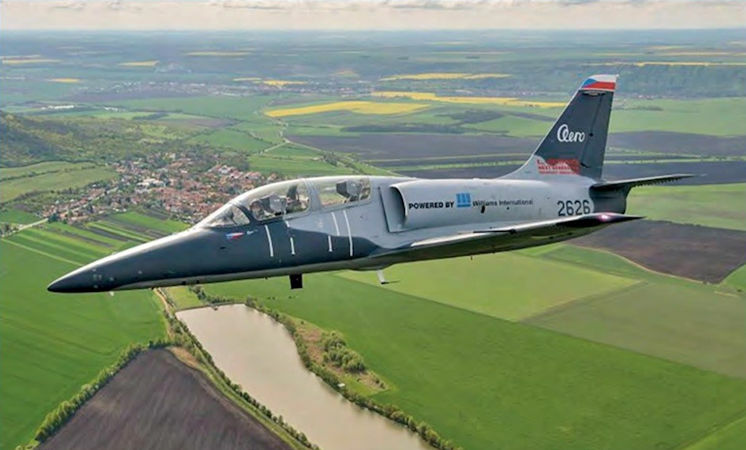 The latest version of Aero Vodochody's veteran trainer, the Williams International FJ44-4M turbofan engine-powered L-39CW has completed flight testing and is being offered as an upgrade package to current L-39 operators. 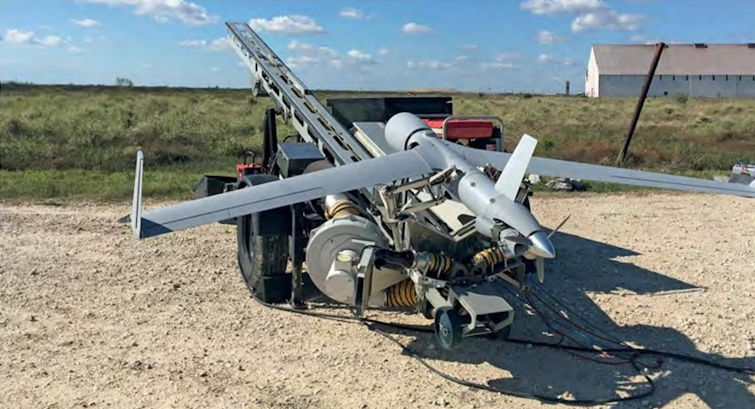 Using unmanned systems to assess infrastructure can reduce ground travel by engineers working in the Surat Basinn of up to 497,096 miles (800,000km) a year, according to Shell. Pakistan Air Force JF-17 16-219 of 14 Squadron returns to the flight line following a display. The Airbus E-Fan X demonstrator will use a BAe 146 and is scheduled to fly in 2020. 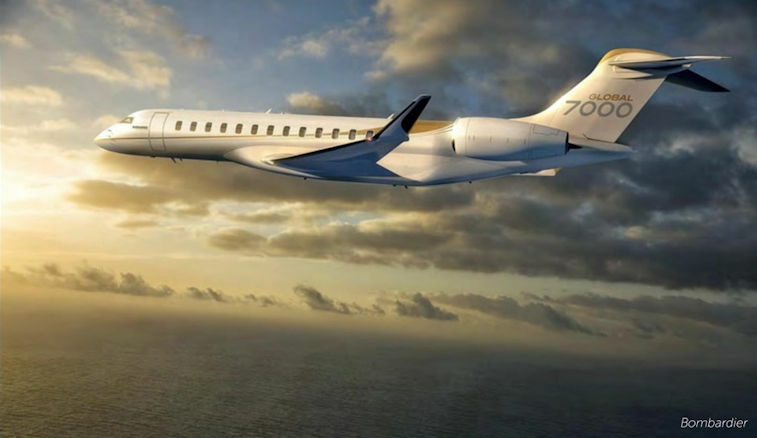 BOMBARDIER ANNOUNCED on December 6, 2017 that two of its Challenger series of business jets had notched up significant delivery milestones in the past few months. 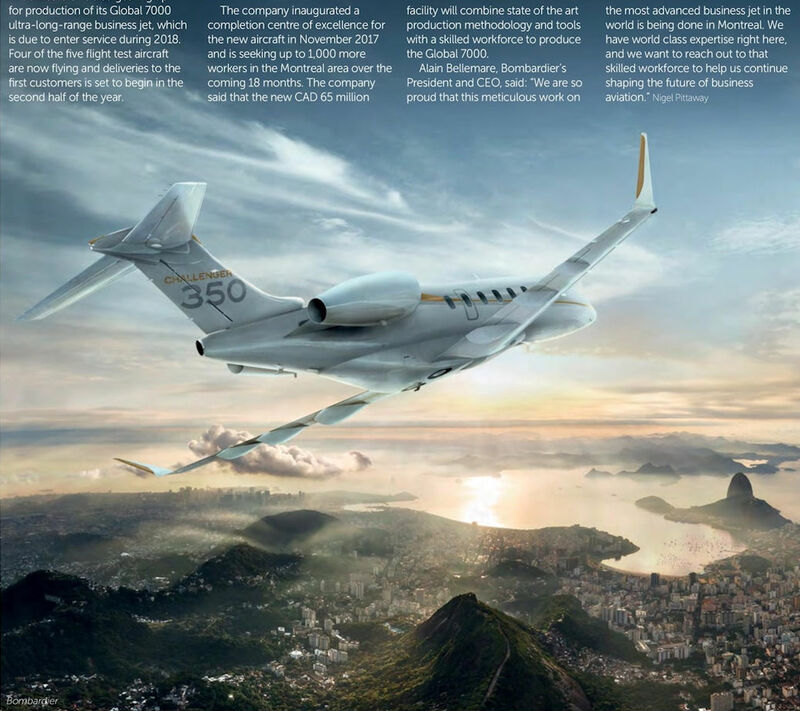 AT THE 2017 Dubai Air Show in November, Embraer announced enhancements to its mid-size Legacy 450 and 500 business jets, including a revised cabin attitude of 5,800ft (1,768m). 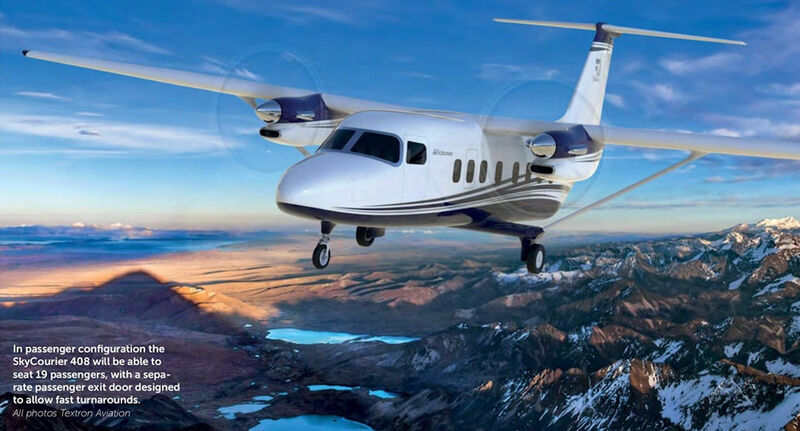 The Brazilian aircraft manufacturer says that the new lower cabin altitude will make them the best in their respective classes in this regard. The final Ejercito del Aire H215 seen after landing at the Airbus Helicopters plant at Albacete. Behind is the second H215 bought by the Ejercito del Aire (registered HD.21-18/802-18) starting engines for a test flight, prior to its delivery to the Gando, Canary Islands-based 82 Grupo in December 2017. The two guns suggested for the C295; lighter 12.7mm is mounted in the doorway. 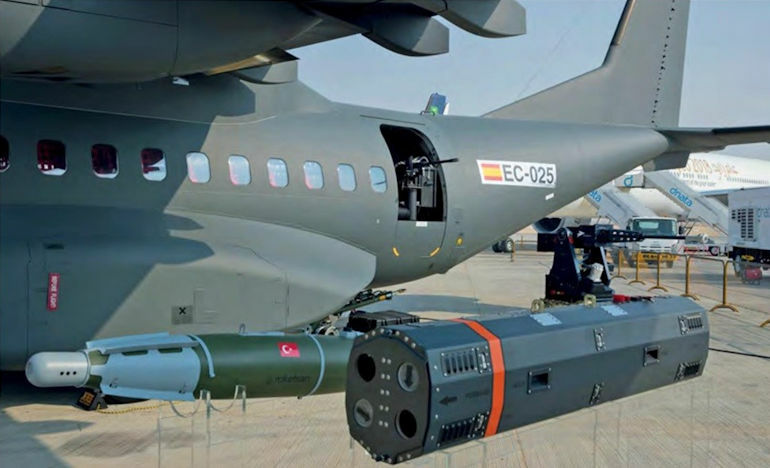 Roketsan’s Cirit laser-guided missile in the foreground and the same company's Teber-82 laser bomb-guidance kit under the wing of a C295. 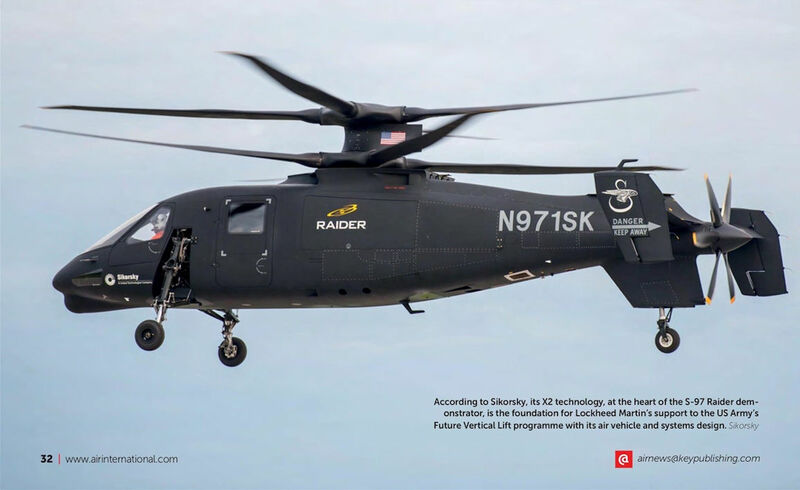 According to Sikorsky, its X2 technology, at the heart of the S-97 Raider demonstrator, is the foundation for Lockheed Martin's support to the US Army's Future Vertical Lift programme with its air vehicle and systems design. 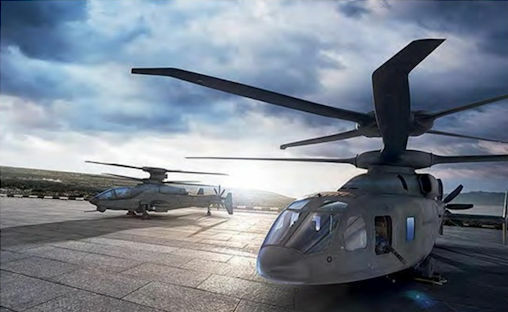 Sikorsky, and its partner Boeing, are proving the scalability and tailoring of Sikorsky's X2 technology with the SB1 Defiant medium-class technology demonstrator. 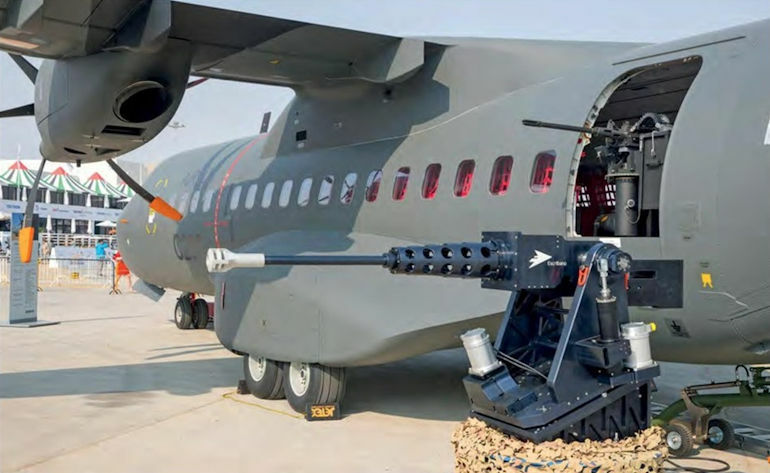 The SB1 is being developed for the US Army's Joint Multi-Role Technology Demonstration programme to help define the Future Vertical Lift (FVL) programme. Technologies used on GE’s FATE engine will be available if a new centre-line engine is required for FVL. 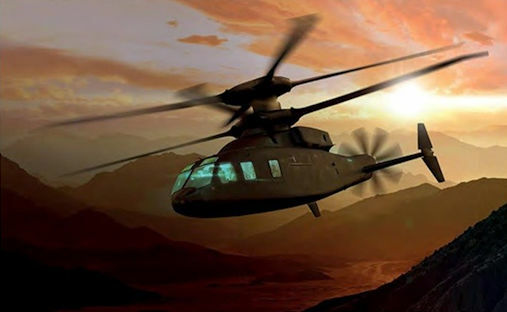 The Sikorsky-Boeing team is developing assault and attack variants of the SB1 Defiant medium-lift helicopter for the US Army's Joint Multi-Role Technology Demonstration programme to help define the Future Vertical Lift programme. Technologies used on GE's FATE engine will be available if a new centre-line engine is required for FVL. 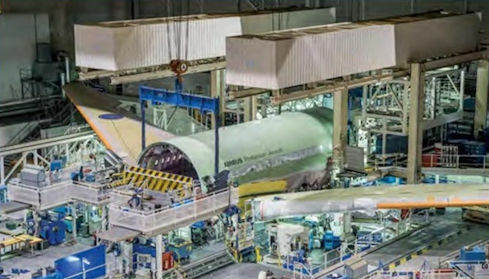 Malaysian Airlines has received its initial Airbus A350-900, 9M-MAB (msn 159), the first of six A350-900s that will serve the airline's long-haul and regional routes. Malaysian is the 17th A350-900 operator and it is the initial airline to put first class seats in an A350. There will be four such seats, along with 35 in business and 247 in economy. 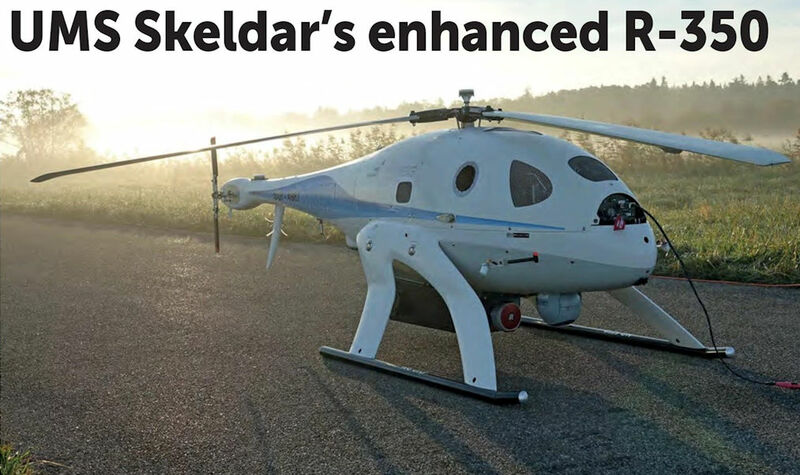 The newly enhanced UMS Skeldar R-350 is designed to carry up to 80kg (176lb) of payload for over two hours. CHINA'S XINHUA news agency has reported that the Harbin AC312E helicopter has completed altitude testing on the Tibetan Plateau, in the country's Yunnan Province. LEONARDO HELICOPTERS announced orders for both its AW139 and AW169 helicopters during the 2017 Dubai Air Show. Detached to Naval Air Station Fallon, Nevada in early December 2017 was EA-18G Growler BuNo 168266/AB500, the latest CAG-bird operated by Electronic Attack Squadron 137 (VAQ-137) 'Rooks'. 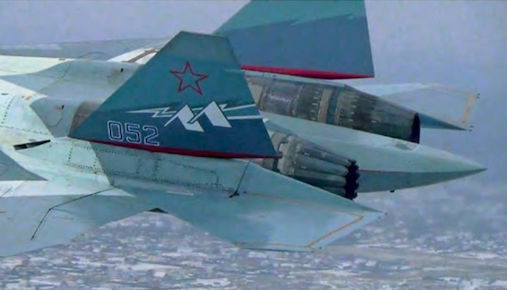 A close-up shot of the engine nozzles of a isdeliye 30 engine installed on the left and a standard (slightly longer) AL-41F1 (isdeliye 117) engine on the right on the second prototype Su-57 fighter T-50-2 during a 17-minute flight flown by Suk­hoi's chief test Sergey Bogdan on December 5, 2017. Seen at Naval Air Station Fallon, Nevada in early December 2017 was Strike Fighter Squadron 87 (VFA-87) 'Golden Warriors' F/A-18E Super Hornet BuNo 168912/AJ302. This aircraft, piloted by Lt Cdr Tremel, shot down a Syrian Air Force Su-22 Fitter with an AIM-120 AMRAAM missile near to the city of al Tabqa on June 18, 2017. A kill marking featuring a Syrian flag and a small black silhouette of a Su-22 are applied below the canopy, and 50 weapon symbols on the fuselage. 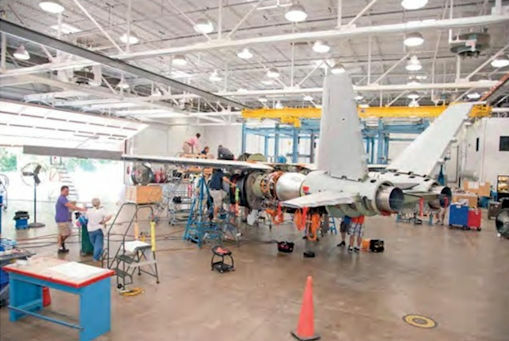 The Scorpion assembly line at Wichita, Kansas. Five of the type have been built so far. 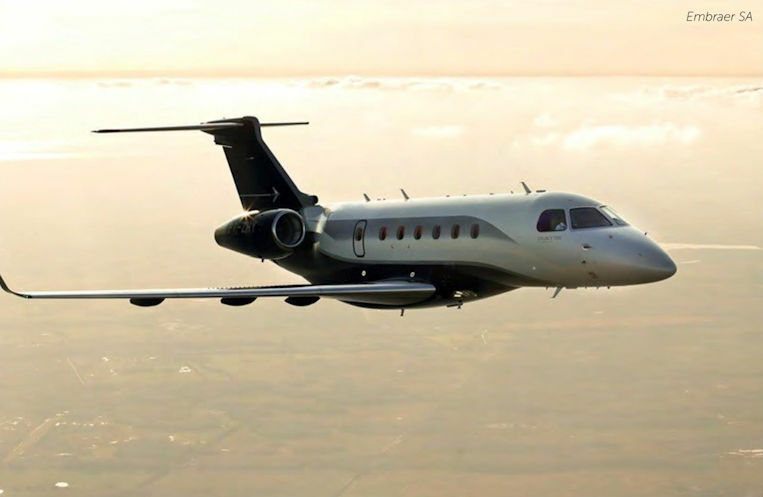 PILATUS ACHIEVED type certification for its new PC-24 business jet from the European Aviation Safety Agency and the US Federal Aviation Administration on December 7, 2017, clearing the way ahead for deliveries to begin later in the month. 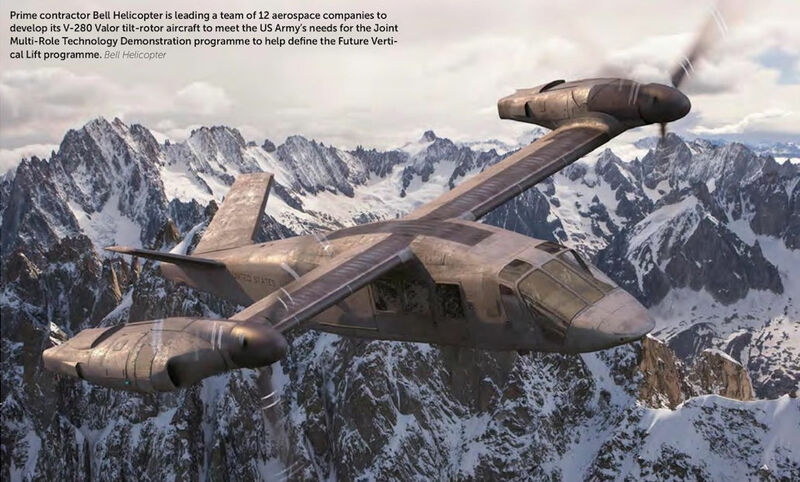 Prime contractor Bell Helicopter is leading a team of 12 aerospace companies to develop its V-280 Valor tilt-rotor aircraft to meet the US Army's needs for the Joint Multi-Role Technology Demonstration programme to help define the Future Vertical Lift programme. Luftforsvaret pilots Stale Nymoen and Thomas Harlem walk from their aircraft, F-35As 5148 and 5150, to the reception ceremony after landing at Orland Main Air Station on November 10, 2017. The F-35I Adir was declared with initial operational capability (IOC) by the Israel Air and Space Force on December 6, 2017. Israel is the first nation outside of the United States to declare the F-35 as IOC. 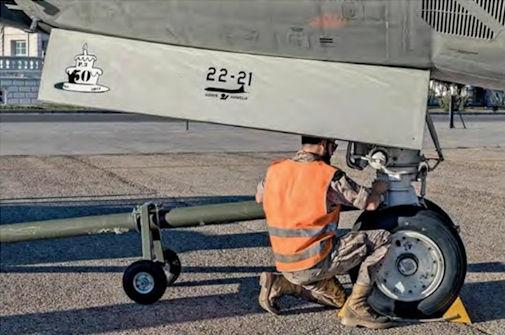 Now equipped with nine F-35Is (six more will be delivered in the Spring of 2018), 140 'Golden Eagle' Squadron based at Nevatim Air Base spent 12-months working-up to an official inspection of all aspects required of a fighter squadron, everything from training to some elements of operational employment. 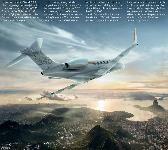 The work-up was undertaken with the first five aircraft delivered to Israel. Further testing and development of tactics, techniques and procedures will continue. 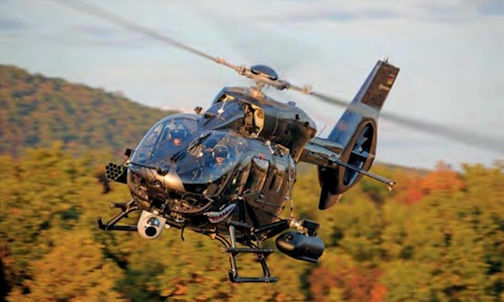 HForce-configured H145M D-HADX at Papa Air Base, Hungary during firing trials that included a 0.50 calibre FN Herstal HMP400 podded machine gun (on the right of the image) and 2.75-inch unguided rockets from an FZ231 launcher (on the left). The first Boeing 737 MAX 8 for a central and eastern European airline was delivered to LOT Polish Airlines early in December. 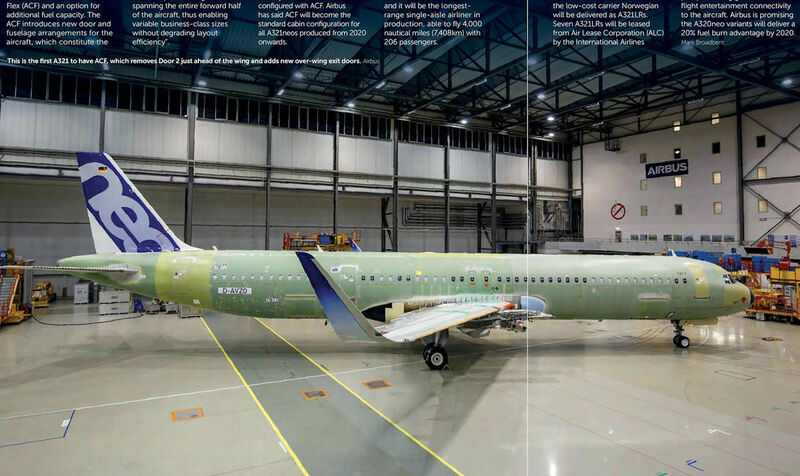 The aircraft, SP-LVA (c/n 64067), leased from the Air Lease Corporation, is the first of six 737 MAX aircraft that will enter service with the Polish carrier by April 2020. Boeing has also recently delivered the initial 737 MAX 8 to a Latin American carrier, with the handover of the first aircraft to Aerolineas Argentinas early in December 2017. 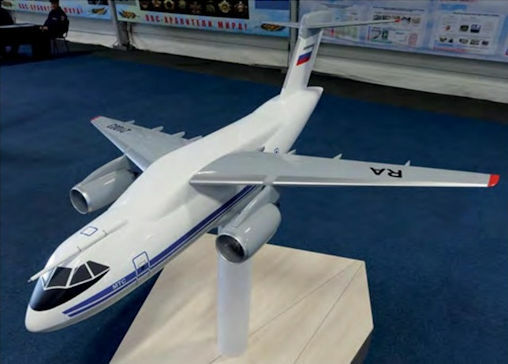 A model of the Ilyushin Il-276 transport aircraft. The Dream Chaser touches down at Edwards Air Force Base at the end of its first free-flight test. In passenger configuration the SkyCourier 408 will be able to seat 19 passengers, with a separate passenger exit door designed to allow fast turnaround. 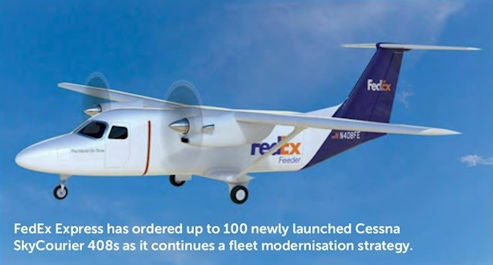 FedEx Express has ordered up to 100 newly launched Cessna SkyCourier 408s as it continues a fleet modernisation strategy.